Cheetahs: Biodiversity of the World: Conservation from Genes to Landscapes reports on the science and conservation of the cheetah both in situ and ex situ, covering such aspects of cheetah biology and ecology as demography, density and feeding behavior; genetic makeup and disease risks; and home range requirements and spatial utilization. The volume includes a broad range of topics, demonstrating the interdisciplinary nature of research and conservation efforts. The book begins with chapters on the unique physiology of this species, followed by the taxonomy and genetic status of the cheetah, leading into their behavior and ecology. The book features contributions on the current and evolving threats to the species, which include habitat loss, declining prey base, human-wildlife conflict with livestock, illegal trade and newly-emerging threats, notably climate change. Cheetahs have been studied through physical examination, laboratory analysis, radio-tracking and human perceptions. Considerable progress has been made in developing strategies to improve their status, including changing farmers’ attitudes and other efforts that have resulted in greater tolerance for the cheetah. Status reports from around the regions are included as well as a better understanding of how international conventions (CITES, CMS, etc. ), and the IUCN Cat Specialist Group have assisted in conservation planning. A section on conservation strategies begins with an overview of the similarities and challenges rural livestock farming communities play in assuring the cheetah’s long-term survival, and continues by including several case studies of successful conservation programs in various countries throughout the cheetah's range. 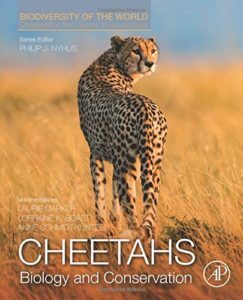 Chapters on the long-term research and role of captive cheetahs to conservation of the species are included, such as disease studies and reproductive strategies by North American and European experts on the subjects.